How is May almost over already? It seems like it just started! I feel like I say that every month. I think I should probably just give up on the months feeling longer. May was a pretty great month. I when to Cincinnati and visited my sister and my niece and nephew. I started selling ad spots and got my first advertisers which I'm so excited to tell you about next week! This month I also posted my 75th blog post of 2017. My goal for 2017 was to upload 75-100+ posts this year. This post is my 83rd of the year. I'm so happy and I'm so proud of myself for hitting my goal and keeping to my every other day upload schedule! So onto what I loved this month. I didn't try many new products this month so I'll be throwing in some old favorites in that I have been using this month. I adore this brush! It never leaves my bag! It is always a favorite! It's is big and fluffy and applies powder beautifully! I love it so much! I have been using this sponge for foundation since I got it. It's the only thing I use now! I love it so much! It applies product so beautifully and blends so well! I finally got a Miracle sponge set and I love these little guys! I've been using my complexion sponge and some concealer to clean up mistakes but now I've got these little guys. I love the side and they really do pick up product! My favorite lipstick. I adore this formula and the 107 shade. If you have ever been on this blog before you have probably heard me rave about it. So I won't go on too much. I love the color and the formula is smooth and soft. It's matte without being drying and I love it! Summer is almost upon us and that means bronzer. I love this bronzer! It is warm without being orange and it is beautifully matte! The color is pigmented without being overpowering and builds or blends out well. I adore this bronzer! It, like the UD one, is warm without being orange and is a really pretty color. It too builds and blends well. I love everything about this palette. The eyeshadow shades are absolutely gorgeous! The gold shimmer one is amazing! The blush shades are beautiful and the bronzer is warm but not orange. All the powders are soft and smooth and well pigmented. I never tried SinfulColors before. I got a bottle of the new Desert Divas collection in my Glow VoxBox and while I hate the color I adore the formula! It dried fast and still hasn't chipped! I love it! I am on the hunt for some of this polish in a color I like. SPI sent me a set of brushes to review and I really like them. They are soft and well made. They look great and apply makeup well. Ok so this isn't technically a TV show but it has been the most amazing games of hockey I've even seen! And my Pens are in the finales for the cup. And I could cry. They only have to win 2 more games and they take the cup for the second year in a row! AHHHHH! Ok I've had my little gush over my favorite sports team back to TV. I watched some of Parks & Rec before and then got distracted by another show. I finally when back and watched the whole series and it was amazing! I loved it! Plus Chris Pratt is in it and anything he is in is just amazing. SPN 12 finally hit Netflix this week! I may have already binge watched the whole thing. I love it so much! But I really need to buy it on Amazon or something because my sleep schedule is officially out the window from the binge watching. I love the Resident Evil Series! Both the movies and the video games! I have seen all 5 movies prior to this one and I was to excited to see the "last" one. I can't believe movies like this when they say it's the last one. The fourth Friday the 13th was called "The Finale Chapter" they then made 4 more Friday the 13ths, Jason Goes to Hell and Freddy VS Jason. The left the ending finished but open ended so I wouldn't be surprised if they didn't release another one called "Resident Evil: The Next Story" or something. I'd watch it. The 3 Pirates of the Caribbean was supposed to be the last one and now the 5th one is in theatres. Anyway the movie was great and I'd be happy if it was the ending and I'd happily see another one if they make it. I've had this song stuck in my head for the last 2 weeks! I love it but I also hate it. It's a great song and I really love the music but you can't help but hate a song when it plays in your head on a constant loop. I finally got a marquee box! I used it for this post's cover photo. I love it! I just wish it was a tiny bit bigger. I had to put Faves instead of favorites because it didn't fit. I still really love it though. I need to order my letters. It only came with 2 T's. Oh my god. This tea is amazing! It's the kind of tea they serve at Chinese restaurants and it is amazing! 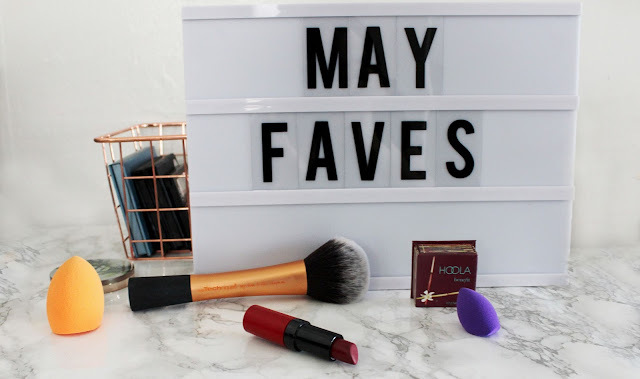 What did you love in May? Let me know what you loved and what I should next month try in the comments down below!